“Half the money I spend on advertising is wasted; the trouble is I don’t know which half.” When credited with this famous quote nearly 100 years ago, John Wanamaker wasn’t faced with the abundance of digital channels marketers contemplate today. I’m sympathetic toward modern marketing leadership. They are responsible for understanding and leveraging multiple channels daily. Still, I’m shocked when companies don’t use multi-channel attribution modeling to inform their marketing communications strategies. Implement the latest online marketing strategies. Call us at (443) 475-07787 or Contact Us. 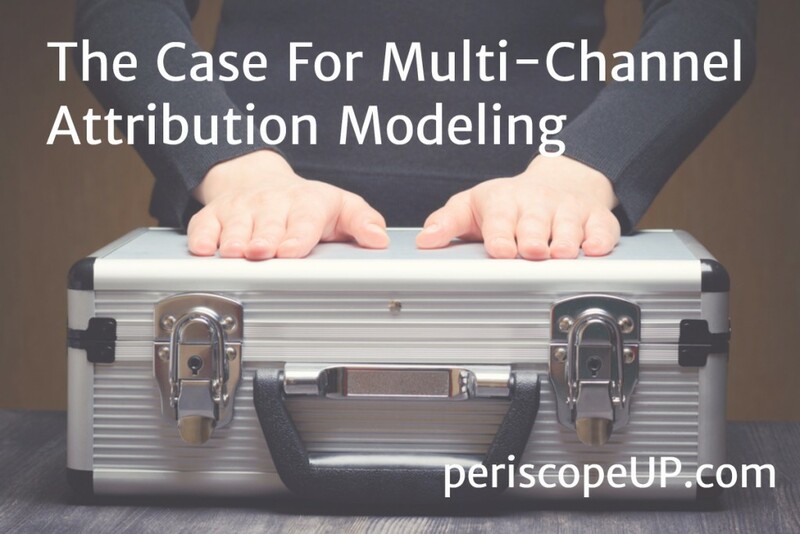 Multi-channel attribution modeling determines which sales and conversions are credited to specific touchpoints or channels throughout the conversion process. When developing models, marketers may determine multiple touchpoints are responsible and weight them based on any number of rules. This is certainly the most complicated area of analytics work we perform, but it’s also the most important. 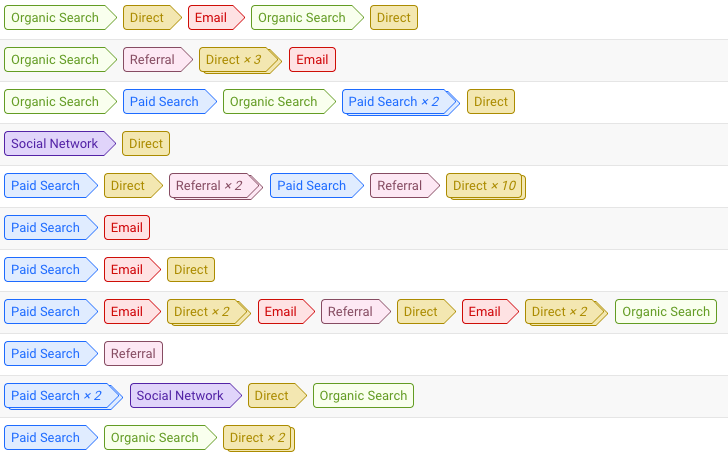 The following screenshot is a Top Conversion Paths report from Google Analytics. Each row walks you through the step-by-step path a user took on their way to converting (purchasing). Here are only 10 rows in a report with over 150 paths (rows) over a one week period. Top Conversion Paths is a report, not a model. There are many models to work with, and depending on your business and channel strategies, you may require multiple approaches. I’ll discuss the various channels in a future post. But now that you’re convinced multi-channel attribution is important, let’s take a look at an example. If you are running Pay Per Click search advertising campaigns, you’re aware Google credits a conversion to AdWords regardless of when that click may have occurred along the path. 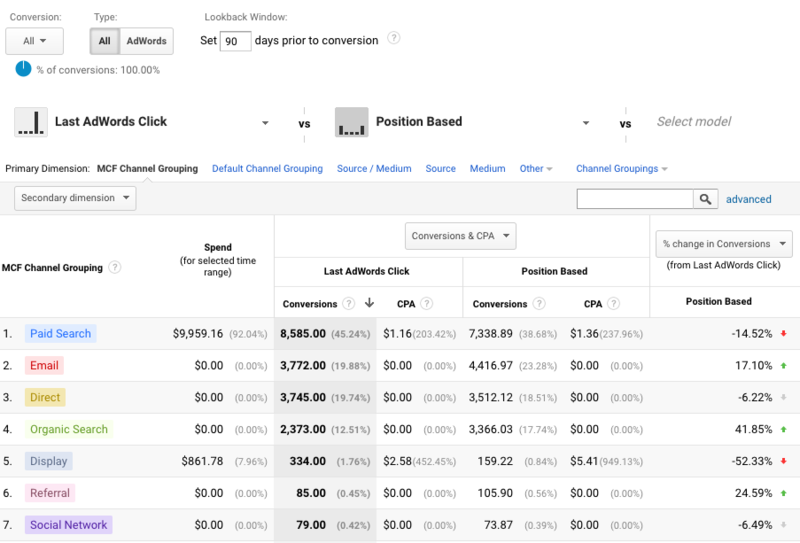 However, in practice an AdWords click is likely just one touch of many. In the model below (Google Analytics Model Comparison Tool), we compare a Last AdWords Click model (giving AdWords all of the credit) to a Position Based Model (40% assigned to first touch and 40% assigned to the last touch with 20% assigned to any number of touches in between) below. In this comparative view we see one obvious takeaway (among many): In a Position Based Model, fewer conversions are credited to Paid Search (AdWords) than reported in the Last AdWords Click model. Google goes even further and informs us with a red arrow and the delta of -14.52%.Is this model telling us Last AdWords Click is taking too much credit for Conversions? Yes it is. There are many more gems in this one model alone, but the point here is to show how easy it is to leverage multi-channel data. To be sure, the work begins when we create models. We must then test, report and repeat – but marketers who focus on multi-channel attribution modeling will better understand which half of their advertising is working. The best practices get the best results. Call us at (443) 475-07787 or Contact Us.